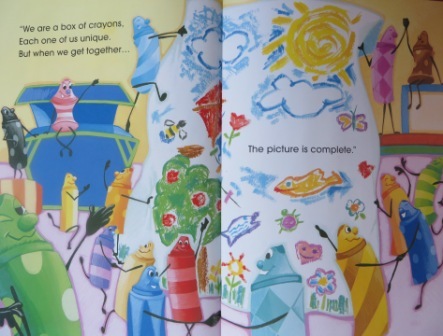 When Jim was my manager, instead of doing the typical corporate diversity training with his team (walking us through a standard presentation ), he sent us all a copy of The Crayon Box that Talked by Sharon DeRolf and asked us to read it before we came together for a virtual meeting. Our team had a fun and engaging experience together celebrating the wonderfulness of our all being different. It wasn’t lost on me that it was Jim’s daring to be different that led to our exceptional experience. There is something very powerful about leaders following their unique creative energy and inspirations. Key in today’s times is slowing down enough to tune into our energy and inspiration, to that part of us that is special. The easier path is often adhering to the ‘that’s the way we do things’ mindset – the challenge, and, indeed, the opportunity, is inviting the most meaningful and impactful possibility. I came across a ‘top 10 list’ about the critical role of diversity for organizations to succeed: The Top 10 Economic Facts of Diversity in the Workplace – A Diverse Workforce Is Integral to a Strong Economy, which claims that diversity fosters a more creative and innovative workforce because bringing together workers with different qualifications, backgrounds, and experiences are all key to effective problem-solving. As the workplace becomes increasingly volatile, uncertain, complex and ambiguous (VUCA), I see a greater need for a workplace characterized by collaboration, experimentation, and innovation, where different perspectives lead to breakthrough solutions, where different beliefs, backgrounds, experiences, ways of relating to things are essential for success. Traditional views of diversity (e.g., racial, gender) will need to expand to include, for example, generational and geographic variability. I’ve been exploring what it takes to live from a place of appreciation for diversity. Words that come to me are curiosity, openness, understanding, empathy, heart and humanity. Lots of questions have been stirred: Do I see the diversity around me? How do I respond to it? Am I grateful, or resistant? Am I responding from a place of love or a place of fear? I created a list of questions to put on my desk this month to help me lean into gratitude for differences. Who is in my network?Who do I choose to embrace as my friends? Who does my work bring me in contact with – my collaborators, my guides and mentors, my teammates? What qualities do we share?What’s common with those my life connects with? How do we behave or think similarly? How does that sense of something mutual feel? How are we different?What makes someone distinct or stand out in a special way? How does it feel to engage with people that I see as different? How do I respond to differences I encounter?Emotionally, mentally, physically. What beliefs create those feelings? Are other responses possible? What thoughts and beliefs are needed to bring about those reactions? What might be possible if I further embrace others’ differences?What chances am I willing to take to lean into this possibility? One of my inspirations for seeing and appreciating diversity is the fall season, when Mother Nature moves through a beautiful transformation, celebrating variety in the form of leaf confetti of every size, color and shape. I admire each special tree and the gorgeous vibrancy of her fall colors, and the way that her magnificence is shaped by each leaf adding its unique contribution. This time of year several years ago I was attending a class for women in North Carolina. We were invited to step out of our comfort zones, be vulnerable, and connect with who we are. In this space, our oneness as a group was clearly evident, and our unique qualities stood out like suns against a brilliant blue sky. 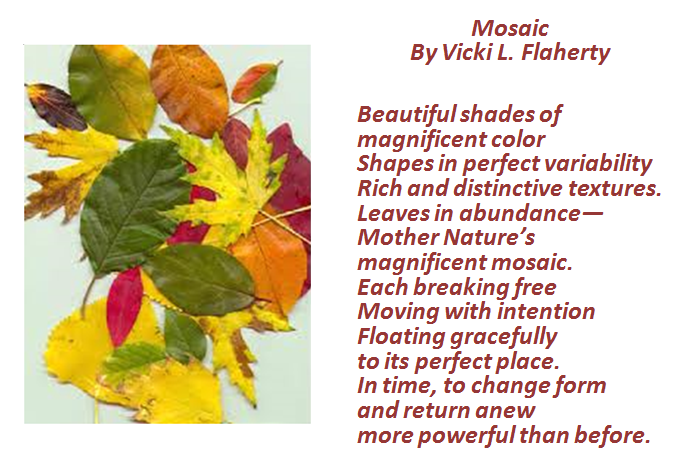 The morning of the second day I found myself walking around the parking lot picking up beautiful leaf specimens and caught the symbolism – leading to the poem included below, a celebration of similarities and differences. May you embrace what makes you different and find joy in the differences you see in others. Vive la difference! I look forward to discovering with you, Sunita! Hi Vicki! Love your work, of course. I also love that your use of Diversity is expanding. The prevailing view is so shallow – just as shallow as discrimination, by the way – focused on surface level differences. There is a large company that uses a strengths- based approach as part of their diversity program so that they get what they desire – diversity in thought and other patterns of excellence to drive innovation and results. Someday, over the rainbow… Onward! Over the rainbow…know you are doing your part to help people and companies get there! You’ve always been about vive la difference since I’ve known you, my rock star friend! Onward!